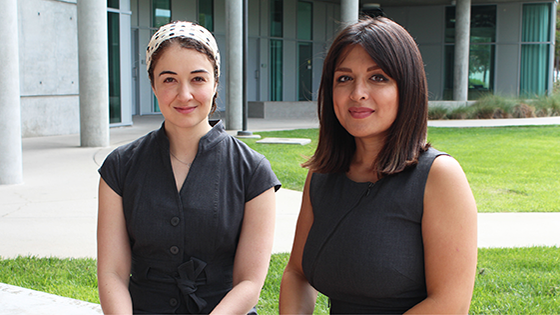 Two Ph.D. candidates at the University of California, Irvine have each received an Elahé Omidyar Mir-Djalali Fellowship for Excellence in Persian Studies from Roshan Cultural Heritage Institute. Recipients Deanna Kashani, Ph.D. candidate in visual studies, and Soodabeh Malekzadeh, Ph.D. candidate in history, will utilize the fellowships to complete their doctoral dissertations. Kashani’s dissertation, “Beyond the Framed Image: Contemporary Iranian Art from Production to Exhibition,” is the first comprehensive study of contemporary Iranian art exhibition structures inside Iran in English. She compares institutionalized, underground, and public art exhibition spaces within Iran to demonstrate how these sites and their agendas influence the production and propagation of art and art historical knowledge. Through the use of art historical and ethnographic methodologies and a diverse set of exhibition case studies, she reveals that the Iranian art world is trying to define itself and its future as experimental, autonomous, and connected with the interests of the local community. Bahram V is only mentioned in passing in monographs that cover a general history of the Sasanian Empire. Malekzadeh’s dissertation fills this gap by providing a comprehensive research on the biography of Bahram V, his legacy in art and literature, and finally, the role of his historical depiction in modern national propaganda. Her study promises to be useful to scholars interested in the history of the Sasanian period, as well as the political, cultural and social history of early fifth-century Persia. "I am grateful to Roshan Cultural Heritage Institute for this generous award and their support of Iranian Studies. The success of my research and that of many others would not have been possible without the passion and support that Dr. Omidyar Mir-Djalali has dedicated to bringing to light the beauty and depth of the Iranian culture and history. It is an absolute honor to be an Elahe Omidyar Mir-Djalali Fellow," said Malekzadeh. Founded in 2000 by Elahe Omidyar Mir-Djalali, Ph.D., Roshan Cultural Heritage Institute is a private foundation that promotes the preservation, transmission and instruction of Persian language and culture. The Institute has provided grants and established numerous endowments at some of the most prestigious universities in the United States - including UCI - and abroad, to support and expand Persian Studies programs, faculty positions, and academic programming activities. Dr. Mir-Djalali is also recognized for her pioneering efforts in nurturing the next generation of Persian studies specialists. Under her leadership, the Institute has awarded hundreds of Fellowships and Scholarships for Excellence in Persian Studies for innovative research, publications, digitalization, translations, doctoral dissertations and other scholarly activities.